By Nell Regan Kartychok on October 26, 2015 2 Comments. This content contains affiliate links. As an Amazon Associate I earn from qualifying purchases. Children of the 80’s, get ready to swoon! 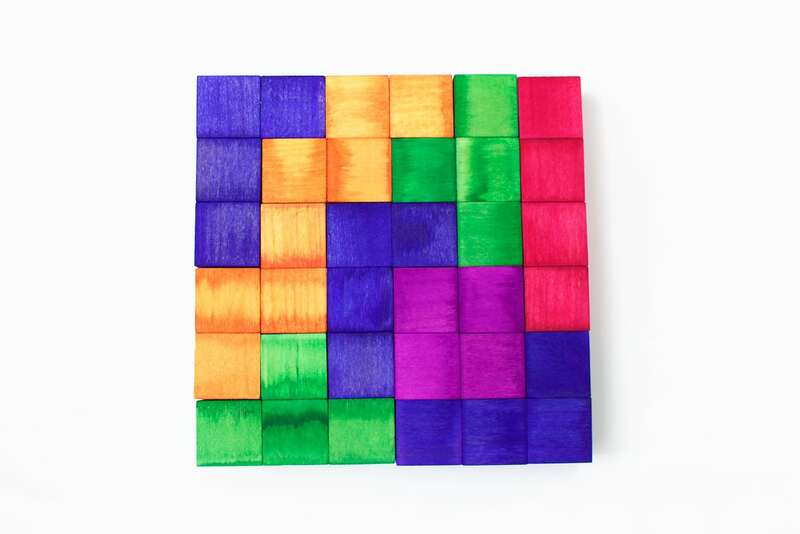 This vibrant Tetris Inspired Puzzle forms a perfect square when solved! 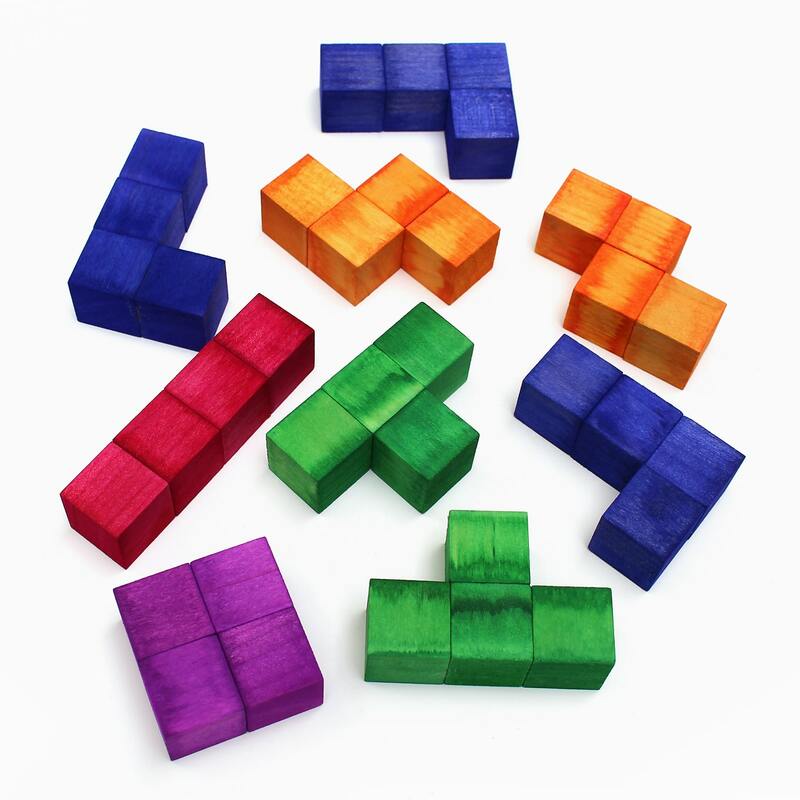 It has more than one solution, and the pieces can also be used as blocks. Kids will have a blast creating this puzzle for a brother, sister, or video game loving friend. I used liquid watercolors to create the colorful blocks you see, but if you have the time and patience, acrylic paints could easily be substituted. You can color each block individually in small jars, or you can color all of the blocks needed for each color at once in a larger container. Use tongs to remove the blocks from the watercolor paint and allow them to dry on an old towel or rag. 2. 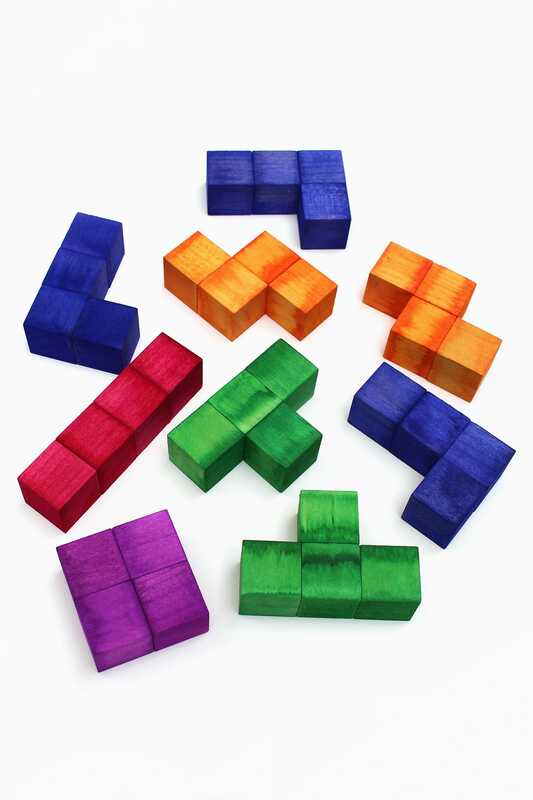 Glue blocks into Tetris-inspired shapes. 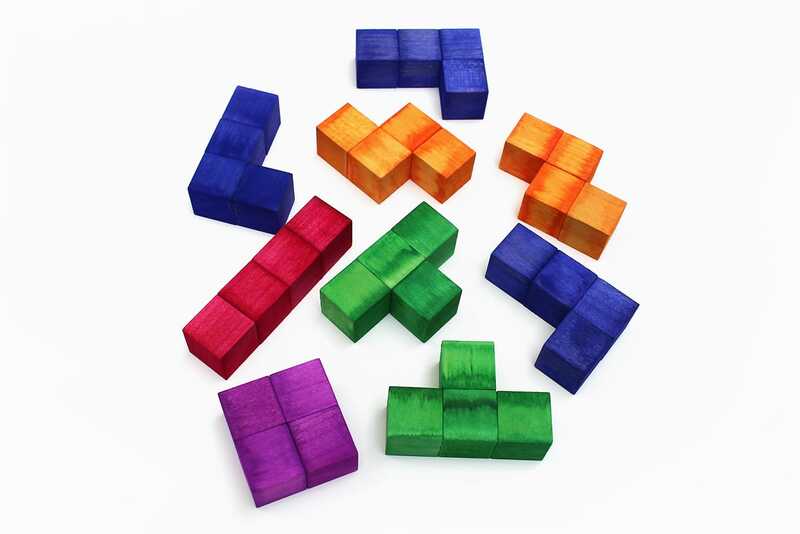 Each shape consists of four 1″ blocks glued together. 3. 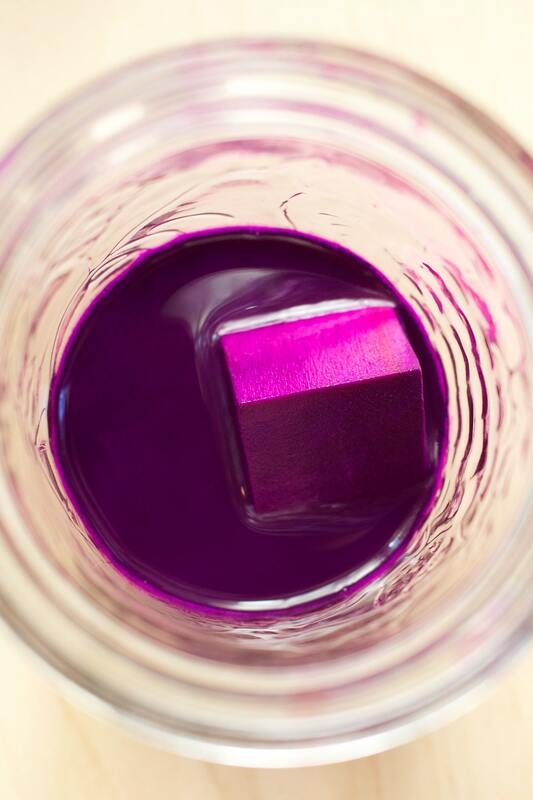 (Skip this step if using liquid watercolor paints.) Paint the shapes with acrylic paints and allow them to dry. 4. If desired, use a brush to paint the shapes with Mod Podge. This will seal and protect the wood. 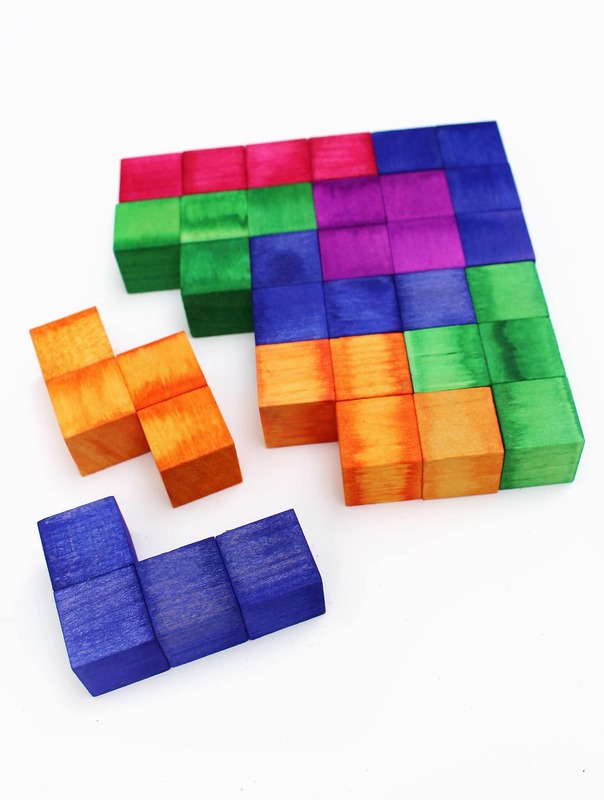 This Tetris Inspired Puzzle is so much fun for kids! They can attempt to solve the puzzle by forming a perfect square, or they can use the pieces as blocks. Both options provide hours of learning fun! Hi! My name is Nell Regan Kartychok. I believe in the magic of childhood, the power of our dreams, spending more time outdoors than indoors, and making this world a greener place to live. I am the creator of Rhythms of Play—where parents can find simple tips, crafts and activities to keep the kids busy all day. These are so cool & love the colors! Thanks! I had a lot of fun figuring out how to make it and putting it together. It’s a lot easier than it looks!